WWE 2K18 will be getting some kind of Collectors Edition this year with physical goodies, but the contents of said edition haven't been revealed. 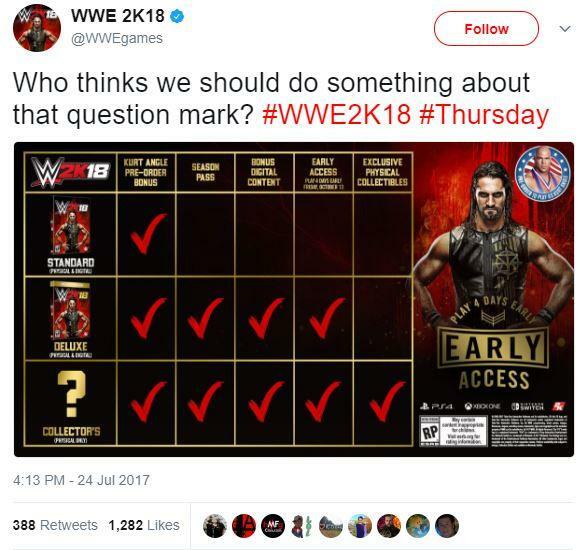 If a recent Tweet from the official WWE 2K Twitter page is to be believed however, we may get info this coming thursday. The question mark refers to the chart released when the game was announced about what you get with each edition. The Collectors Edition was simply marked with a question mark in regards to what was included with it. The WWE 2K17 Collectors Edition included an NXT Wrestlers DLC pack, a Finn Balor action figure and a lithograph autographed by Shinsuke Nakamura so I would assume this years edition will include some similar content including another figurine and an autograph. WWE 2K18 releases on October 17 for PS4 and Xbox One.